Our Sun is a normal main-sequence G2 star, one of more than 100 billion stars in our galaxy. Its diameter is 1,392,684 km. [about 865,684miles] its mass is 1.989x 10 to the power 30 kg. It's temperature: 5800 K (surface) and 15,600,000 K (core). The Sun is by far the largest object in the solar system. It contains more than 99.8% of the total mass of the Solar System. The Sun is, at present, about 70% hydrogen and 28% helium by mass everything else ("metals") amounts to less than 2%. This changes slowly over time as the Sun converts hydrogen to helium in its core. The solar cycle [the magnetic activity cycle] is a periodic change in the amount of irradiation from the sun that is experienced on Earth. It has a period of about 11 years and is one component of solar variation. The outer layers of the Sun exhibit differential rotation: at the equator the surface rotates once every 25.4 days; near the poles it's as much as 36 days. This odd behaviour is due to the fact that the Sun is not a solid body like the Earth. Similar effects are seen in the gas planets. The differential rotation extends considerably down into the interior of the Sun but the core of the Sun rotates like a solid body. Conditions at the Sun's core (approximately the inner 25% of its radius) are extreme. The temperature is 15.6 million Kelvin and the pressure is 250 billion atmospheres. At the centre of the core the Sun's density is more than 150 times that of water. The Sun's power (about 386 billion billion mega Watts) is produced by nuclear fusion reactions. Each second about 700,000,000 tons of hydrogen are converted to about 695,000,000 tons of helium and 5,000,000 tons (=3.86e33 ergs) of energy in the form of gamma rays. As it travels out toward the surface, the energy is continuously absorbed and re-emitted at lower and lower temperatures so that by the time it reaches the surface, it is primarily visible light. For the last 20% of the way to the surface the energy is carried more by convection than by radiation. There are several Solar Dynamo Models, here they are animated: The Solar Dynamo: Toroidal and poloidal Magnetic Fields, Plasma Flows and Toroidal and Radial Magnetic Fields. The surface of the Sun, called the photosphere, is at a temperature of about 5800 K. Sunspots are "cool" regions, only 3800 K (they look dark only by comparison with the surrounding regions). Sunspots can be very large, as much as 50,000 km in diameter. Sunspots are caused by complicated and not very well understood interactions with the Sun's magnetic field. Another feature of the photosphere is granulation. This is the lowest of the three layers of the solar atmosphere and is the visible surface of the Sun that is most familiar to us and this name literally means sphere of light. This is a layer of gas that is only about 400km thick when compared to the 700,000 km solar radius. Looking down into the atmosphere at the surface of the Sun the view becomes more and more opaque. The point at which it appears to become completely opaque is called the photosphere. The photosphere can be considered as the imaginary surface from which the solar light that we see appears to be emitted. The diameter quoted for the Sun usually refers to the diameter of the photosphere and is estimated to be 1,392,684 km . Through the photosphere the solar atmosphere changes from being almost completely transparent to being almost opaque over a distance of about 400 km. Through this region the temperature drops rapidly the closer to the surface, and the pressure (measured in bars, where one bar is the average atmospheric pressure at the surface of the Earth) is very low - generally 1% or less of Earth surface atmospheric pressure. The radiation temperature is about 5780 Kelvin and the peak output is from the centre in the form of visible light. The photospheric temperature ranges from 6600 Kelvin at the bottom to 4300 Kelvin (temperature minimum) at the top. The photospheric density is about one hundred millionth of that of water. The photosphere marks the transition from the convection zone to a convectively stable atmosphere. In this region photons can freely leave the Sun as the atmosphere does not have as many absorbing atoms per unit volume. Further the decreasing density contributes to the transparency. The photosphere starts just above the area where ionized hydrogen has recombined to hydrogen. In the photosphere, the neutral hydrogen readily combines with electrons to form negatively ionized hydrogen which is an effective scatterer. The electron density is a strong function of density and the negatively ionized hydrogen drops off rapidly above the photosphere. The Sun's limb is darker than the centre and this is known as limb darkening. Photospheric light travels through an absorptive medium. This means that we can only see so far into the photosphere. At the limb, the line of sight sees the top of the photosphere, or about 4300 Kelvin. At the centre, the line of sight sees deeper into the Sun, and a higher temperature. The limb looks darker because it is higher in the atmosphere which is cooler than at disc centre. Another effect that can be observed in the photosphere is the electron transitions that form absorption lines. Absorption lines form at different heights in the atmosphere and so they can be used to map different layers in the photosphere. Further, velocity along the line of sight can be deduced by the line broadening. The photosphere comprises bright, bubbling granules of plasma and darker, cooler sunspots that emerge when the Sun's magnetic field breaks through the surface. Granulation occurs at the photosphere and these cells represent the top of convection currents operating just below the photosphere, transporting heat from below to the surface. This convection produces columns of rising gas (granules) to the upper levels, which then cools off and plunges back down into the interior. This moves at a rate of a few kilometres per second, so not very rapid, but noticeable. In granulation, the brighter central regions show hotter gas rising upwards and the darker, narrower parts correspond to cooler gas sinking back down into the interior of the Sun. Time lapse white light photography clearly shows this boiling effect that looks very similar to a pan of boiling water. This is a very rewarding target for white light solar astronomers. Sunspots demonstrate obvious evidence for solar activity. They occur where there are regions of intense magnetic field (up to 3000G) on the photosphere. They appear as very large dark irregular shaped regions moving across the surface of the Sun expanding and contracting as they move across the solar disk. They are sometimes isolated but are frequently found in clusters referred to as Sunspot Groups. Sunspots are not permanent features on the photosphere, but they last between a few hours and a few months. The brighter surrounding area of a sunspot is called the penumbra (where the magnetic field lines are inclined) and the darker central region is called the umbra (where the magnetic field lines are vertical). Time lapse videos on sunspots can pick out ribbed structures in the penumbra that can be seen slowly flowing into the umbra. Temperatures of sunspots are lower than the rest of the photosphere, hence they appear darker. Using Wien's law, it can be shown that the typical temperature of the umbra is 4300K and the typical temperature of the penumbra is 5000K. Sunspots can be used to measure the rotation of the Sun by tracking them as they move across the solar disk. However, they also show how the Sun exhibits differential rotation. This takes place, as the Sun doesn't rotate as a rigid body. The rotational period of the sun increases with increasing latitude, showing the period is slower at the poles. Sunspots appear to move across the Sun's disk due to solar rotation. Observing this motion allowed the early astronomers to realize that the sun rotates on its axis. The sun's equatorial regions rotate in about 27 days (25.4 days when viewed from Earth), while the Polar Regions take more than 35 days to make a complete solar rotation. The number of sunspots visible on the photosphere periodically varies every 11 years. This is known as the sunspot cycle and was discovered in the early 19th century. These cycles demonstrate that the variation in magnetic activity on the Sun's surface reaches a maximum and a minimum. Rivers of magnetic flux are created just below the photospheric surface and then rise upward and emerge through the surface, due to this magnetic field region being dragged around the sun faster at the equator than at the poles. This is where sunspots appear and are sites where solar flares are observed to emanate from (these are known as an Active Regions - regions of intense magnetic activity). At the beginning of the sunspot cycle, sunspots tend to appear at latitudes between 30° and 40°, a bipolar sunspot pair, one with a negative polarity and one with a positive polarity and one always leading the other. As the cycle progresses, the sunspots tend to appear closer and closer to the equator as magnetic flux streams towards the poles. Sunspot maximum marks the part of the cycle where there is the most magnetic activity, i.e. more sunspots, and sunspot minimum, when there is less activity. Currently, we are right in the middle of sunspot maximum of sunspot cycle number 24. The imminent flip of the solar magnetic poles will mark the midpoint of this current maximum. The Maunder Minimum was between 1645 and 1715 when the Sun went through a very inactive stage. There were very few sunspots seen and predictions state that the Sun is heading for a new phase of low solar activity. The sunspot cycle is only one half of a bigger cycle, known as the solar cycle. The solar cycle lasts for about 22 years as it takes into account the fact that at the end of one sunspot cycle (11 years), the polarity of the Sun reverses. Therefore, sunspots during one sunspot cycle may have a positive polarity, but in the next cycle, they will have a negative polarity. An even larger photospheric feature is supergranulation that can be seen when using the Doppler effect to measure the flow of material in the photosphere. These are enormous convective cells within the photosphere. In Dopler images of supergranulation the red is light from material moving away from us and the blue is light from material moving towards us. Faculae are more easily seen near the limb of the Sun. They are bright areas of concentrated magnetic field, which tend to make the sun look brighter. During the sunspot maximum, they make the sun look 0.1% brighter. The photosphere is also the source of solar flares: these normally occur when the highly contorted magnetic field lines around sunspots suddenly reconfigure producing huge amounts of thermal energy allowing the local surface temperatures to increase into the low millions of degrees Kelvin. Solar flares also produce bursts of X-rays, ultraviolet radiation, electromagnetic radiation and radio waves. This is name basically means the sphere of colour and this is the second of the three main layers that form the Sun’s atmosphere. It is about 2,000 kilometres deep and sits directly above the photosphere and is overlaid by the solar transition region. The chromosphere is a low density region and is 10,000 times less dense than the photosphere and one hundred million times less dense than the Earth’s atmosphere at sea level. The only time the chromosphere is visible to the naked eye is during total eclipse where it appears as pink to red outer shell. It is very easy to pick out the chromospheres using a hydrogen-alpha telescope and slightly more difficult in a CaK telescope. Using a single stacked H-alpha telescope the photoshphere is able to leak through the image leaving a duller outer ring to the edge of the surface and this is the chromosphere. When double or triple stacking the photosphere is no longer able to leak through and the thickness of the chromosphere is no longer obvious. The temperature of the chromosphere was measured by Skylab and is about 6,000K at the lower boundary with the photosphere; it drops to a minimum of about 3,800K just above this and then increases upwards to about 35,000K at the outer boundary – the transition layer of the corona. There are many interesting features/phenomena can be seen in the chromosphere as it is a region that is very complex and dynamic. The most common chromospheric feature in the presence of long thin fingers [jets] of luminous gas known as spicules that are usually under 10,000 km long. They rise up and down over a period of about 10 minutes. They are similar in appearance to blades of grass. There are also horizontal wispy gas features that last for about 20 minutes that are known as fibrils. These are sometimes referred to as dark mottles and give rise to the orange peel effect seen in H-alpha telescopes and comprise a seething mass of spicules and fibrils. Looking directly at the chromosphere it is possible to see bright cells known as the network, and the surrounding black regions are known as the internetwork. They can look similar to granules but granules are purely a photospheric convection feature that is only common to observe in filtered white light. Filaments and prominences form at the base of the chromosphere and rise up through it and can encompass a large number of different forms – see later. They can reach heights of up to 150,000 km while in a relatively stable condition/structure but they can go well over 500,000 km in height as they lift off from the surface during an ejection. 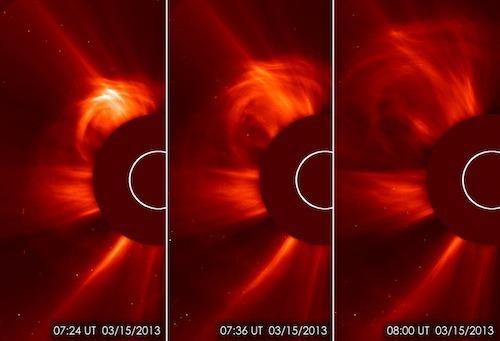 They are gigantic plumes of gas that are very cool when compared to the corona in which they sit. There are also some large bright structures that underlie the base of the spicules and fibrils that are known as filigree and these often form chains that connect and are known as the large chromospheric network a feature that is easier to see in the calcium chromosphere. It is sometimes possible to detect chromospheric shock waves that are triggered by impulsive solar flares. These features were first detected by Gail Moreton who along with R. G. Athey published a paper “Impulsive phenomena of the solar atmosphere” in 1960. These features are now known as Moreton waves. Since then a number of solar shock waves have been recorded one of the largest being after an X-6.5 solar flare in 2006. I personally captured one on the 4 March 2012 after an M2-class solar flare event. They travel at velocities of about 1000 km/s. Occasionally the solar flares can trigger shock waves that travel across the Suns surface like ripples in a pond. These are called Moreton waves and this was my first capture of such an event on the 4th March 2012. Sequence from 10-33 to 11-41UT. Prominences and filaments are H-alpha features that project well beyond the limb of the Sun and although anchored at the base of the chromosphere they extend well beyond it. There are two main classes Class 1 the Quiescent long lived [Quiet Region Filaments] and Class 2 the Active [Limb flares, surges, sprays and post flare loops]. Solar flares are moderate to large and extremely bright transient emission features that can last from just a few minutes to over four hours for the very large X-class events. They are rapid and often violent releases of energy from reconnections of magnetic field stress that can occasionally trigger the ejection of solar material in the form of Coronal Mass Ejections [CME]. Here you see my capture of the sunspots comprising active region 1302, you can clearly see filaments and one of which suddenly fractures releasing a huge M-class solar flare and associated blast wave under some feint magnetic loops. 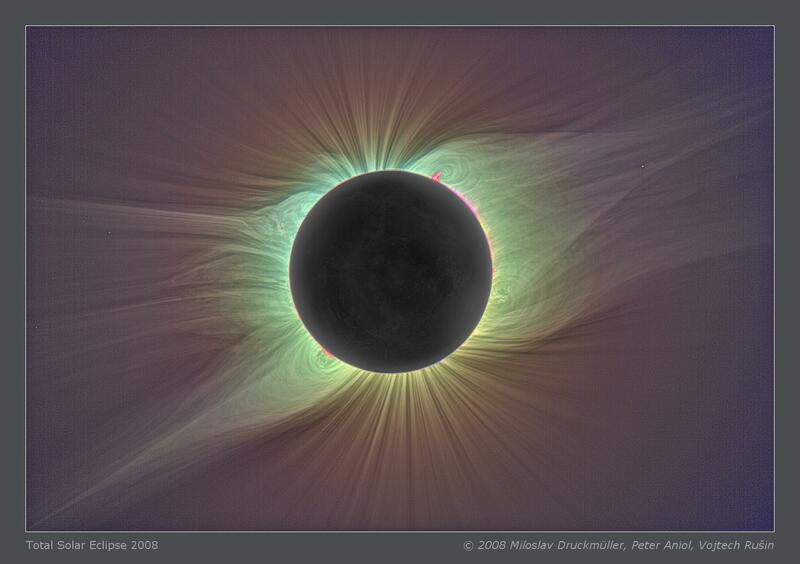 The solar corona is the extended outer atmosphere of the Sun that has a glow that is about a million times less bright than the photosphere. The corona is so thin that it is about 10 billion times less dense that the Earth’s atmosphere measured at sea level and that density reduces as the distance from the Sun increases. 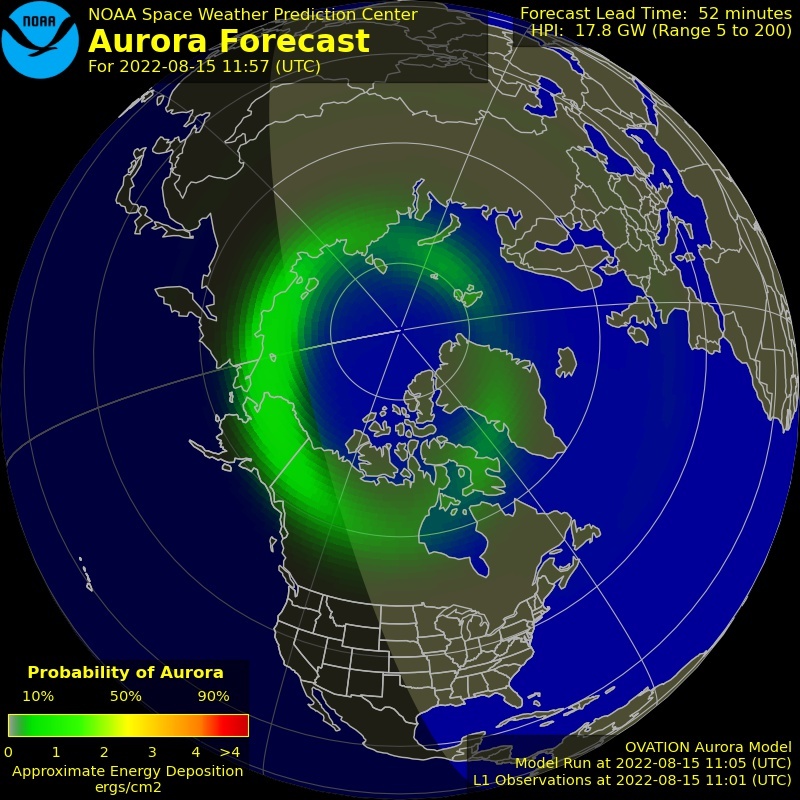 It demonstrates the visible signature of the solar wind and illustrates the Sun’s extended magnetic field lines, the polar plums – long thin streamers that project outward from the north and south polar-regions and helmet streamers - large cap like structures with long pointed peaks that usually overlie active regions. There are also occasional coronal holes the regions where the corona is dark and the coronal loops covering the active regions that can last for days. There are also the short lived post flare loops that contain denser material that form as the magnetic field reconfigures after strong flares and the high velocity clouds of ejected materials forming the coronal mass ejections. The present Earth – Moon distance has left us with a unique opportunity to directly view the solar corona during the very brief periods of “totality” during total solar eclipses. These events occur somewhere on Earth on average every 18 months they can only last for a maximum of just over 7 minutes. There is a way to observe the corona outside total eclipse conditions using an instrument known as a coronograph first introduced by Barnard Lyot in 1930. It is a telescopic attachment designed to block the direct sunlight with an occulting disc so that the more tenuous corona can be viewed. Since the 1930’s they have been introduced into many solar observatories and possibly the most famous of which is the LASCO instrument onboard the SOHO satellite. This giant solar prominence was photyographed with a coronograph at Climax, Corado as it erupted on 4 June 1946. Coronographs operating in the Earth’s atmosphere suffer from the scattering of the sunlight from the atmosphere itself and at view angles close to the Sun the sky is much brighter than the background corona even at high altitudes on clear bright days. The ground based observatories such as Mauna Loa use polarization [a property of waves that can oscillate with more than one orientation] to distinguish the sky brightness from the image of the corona. There are some very talented amateur astronomers that are starting to build and use their own coronographs that are being used to make spectacular images of solar prominences. I have included links on my website for those wishing to read up further on this topic. With the use of hydrogen-alpha and calcium-K telescopes we amateurs are able to see and photograph some of the features that extend into the corona such as prominences, solar flares and post flare loops and occasionally a prominence/filament that lifts off to eventually become a coronal mass ejection [CME]. To capture the feint true coronal signatures it is necessary to pursue and photograph the fleeting total solar eclipse events and these can lead to visiting some very distant locations with no guarantee of success. I personally only have the one experience of the 1999 total eclipse in Cornwall UK and saw nothing but total cloud cover and the darkening of the sky. I was extremely disappointed and would have been even more disappointed if I had spent thousands of pounds on the trip! If you wish to check out the time line of solar astronomy then follow this included link or here is an excellent piece about the Sun. There are lots of solar flare captures on my website and so here is a chance to view them all in chronological order of magnitude starting with the largest at the top. They ate all my own work except where others there is a credit to right hand side.